Time to have some fun in your child’s bathroom! Don’t be mistaken, yes your master bathroom is important, but so is every bathroom in your house, including your children’s bathroom! I have some fun tips to share with you on how to make a kids bathroom of your and your child’s dreams. 2. This girl’s bathroom is great space to share! The curves in the cabinetry give this space a sophisticated, fun, and soft feeling. Try adding shapes such as these waves into your children’s bathroom and you’re young child as well as yourself will feel comfortable using this space. 3. I cannot say enough good things about adding wallpaper with a fun print into your children’s bathroom! This wallpaper makes this space completely and utterly their own and wallpaper can always be changed out as they grow into young adults! Photo by Flegel's Construction Co., Inc.
4. 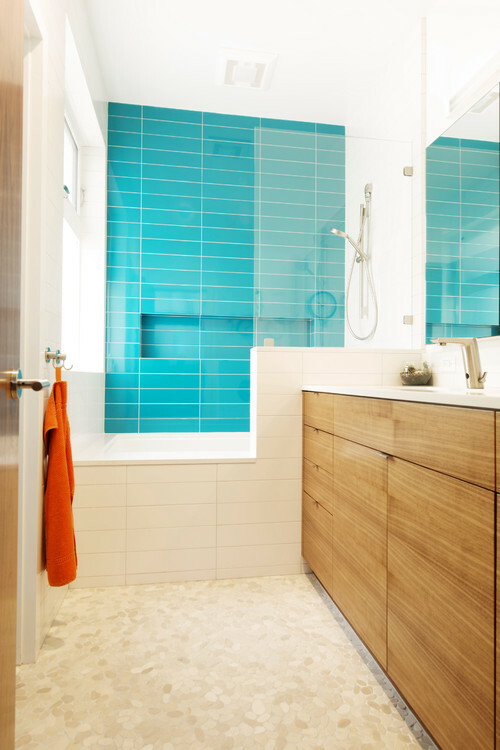 Just like your tile, your cabinetry is also a great way to add a pop of color! And the colors in this rug!! A fun young rug is sometimes all you need to make this a kid- worthy space. I know that I would more than happy to grow up with this bathroom well into my teens and early twenties.